House with 3 suites, garden next to a forest reserve, 3 min from Geribá! Welcome to Casa da Floresta, which underwent a complete renovation between July / 16 and July / 17. The house has total privacy, in a condominium with total security. There is a large private garden, a relaxation area with jacuzzi and sauna overlooking the forest, full gourmet area, spacious and modern American kitchen, 2 TV's 55 '4K, all of which are less than 5 min from the Geribá beaches, or a 10 min walk. The house sits next to a forest that brings to the area an incredible peace! The renovation carried out in the house put it on a different level from what is found in this city. Instead of the common power showers that provide showers, there is hot water in modern showers with pressurizers and water filter, providing a bath with plentiful and filtered hot water fall in all bathrooms and sinks of the house. The house is a real gastronomic paradise among friends. The American kitchen provides complete integration between the cook and the other guests, facing a modern Smart TV of 55 '' 4K. All appliances are Brastemp Gourmand top of the line, and the kitchen is complete with all the necessary utensils, including a modern dishwasher, so the tenant does not waste his time. The gourmet area is a show apart for lovers of a good barbecue. It features a Charbroil gas barbecue, a modern charcoal grill and a wood-fired oven, so guests can choose their preferred form of cooking. There is also a Consul brewery that keeps your beers or other drinks stupidly chilled. Lastly, there is also a two-burner cooktop to aid in the tasks and make this space independent of the outside kitchen. 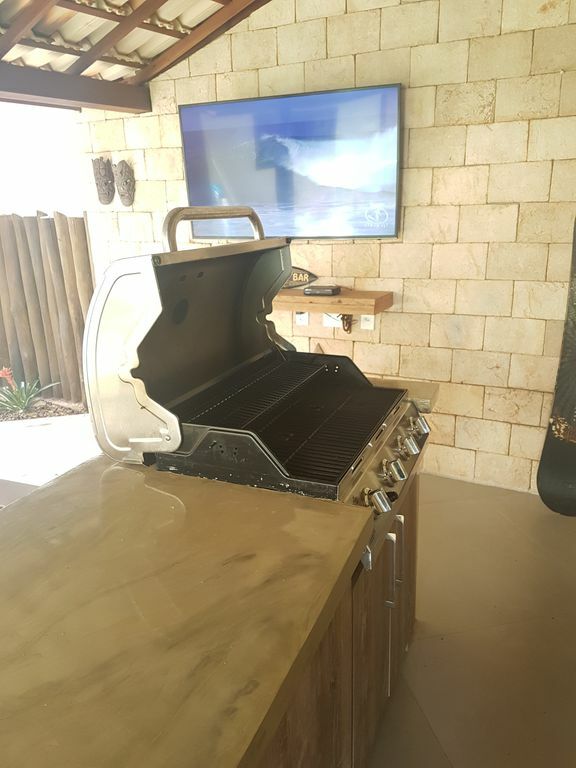 The gourmet area also features a Smart TV 55 '' 4k, and the layout of the space makes the interaction between the barbecue and the other guests constant. There is also a fitness space with several functional outdoor exercise equipment, facing the large 55 'TVs, to the sound of birds. The relaxation area, with a beautiful view of the forest, cona with a large jacuzzi on a spacious deck, with 42 air vents, pillows and color therapy with a plethora of color combinations. There is a thermal cap to prevent accidents with children. Just next door, there is a beautiful sauna to overlook the forest. There is a front garden and a side, in which is a beautiful shower hidden in the middle of the forest. All rooms have split air conditioning, ceiling fan and cabinets. The lighting throughout the space is modern and cozy, and the integration between the guests is constant thanks to the large amount of glass used in the construction. Aiming at a different relationship with the tenants, the house offers all that is necessary for guests to truly feel at home. Items such as coffee, numerous spices, pepper and rose salt of Himalayas in grinders, olive oil, vinegar, sugar, coffee, coffee filter, access to my private garden, excellent quality toilet paper, are offered to the tenants as a courtesy. Bed linen and bath, espresso machine, modern kitchen items such as blender, juice centrifuge, toaster, etc. are provided free of charge. The large TV's have a connection to the free wi-fi, being able to watch Netflix, Youtube, etc. The living room TV has Sky point with the recording device and full programming, and the TV of the barbecue has another individual Sky point. Both have the PREMIERE football package, so that the guest can quietly watch their heart's game. For those with small children, there is a 3.5m trampoline that can be left in the garden, or withdrawn, according to the wishes of the guest. The condominium also has a complete structure, with a huge swimming pool, steam and dry saunas, soccer field, games room and children's park, as well as a beautiful view of Manguinhos beach. I did the remodeling of this house with the affection of who actually spends most of the year here, so expect to really feel at home, not in a summer face. This is the biggest difference of mine for the others that exist in this beach resort. I will be available for any questions, and a user manual will be provided prior to check in. The concierge is also very close to the house, which brings even more security. A cleaner of my total confidence is available for cleaning and cooking for a daily payment of 150 reais, but for rentals of 7 days or more, a free weekly cleaning will be provided on my account. Rentals of 7 days or more will be grateful for other niceties, such as free Nespresso Capsules and "snowy" beers at the brewery. The Condominium includes: game room, pool, barbecue, soccer court, garden, deck, sauna and steam. Saunas typically operate on Saturdays and Sundays from 19:00 to 21: 00hs. the fifth Avenue bumps. José Bento Ribeiro Dantas - the main city). O preço para a temporada de Revillon é de R$ 6.500,00, independentemente do locatário querer diminuir a estadia de 10 dias. O preço para a temporada de Carnaval é de R$ 5.400,00, independentemente de o locatário querer diminuir a estadia de 9 dias. O preço para a 1ª quinzena de janeiro é de R$ 4.000,00, independentemente de o locatário querer diminuir a estadia de 13 dias. O preço para a 2ª quinzena de janeiro é de R$ 4.000,00, independentemente de o locatário querer diminuir a estadia de 13 noites. A entrada se dará sempre após às 16h, e a saída às 12h, podendo haver flexibilidade nesses horários conforme a disponibilidade da casa. É obrigatório o pagamento de uma faxina na metade da estadia e de outra na saída, no valor de R$ 130,00 cada uma, não incluso no valor do pacote. O acesso à Internet wireless banda larga é gratuito (não incluso no aluguel). O Locador não se responsabiliza por eventuais interrupções do serviço, quer por problema do condomínio (antena), quer do provedor de acesso (Velox). Negociação de desconto para estadias longas via email.